RATM will play their first LA concert in 10 years this Friday. Expect fireworks! 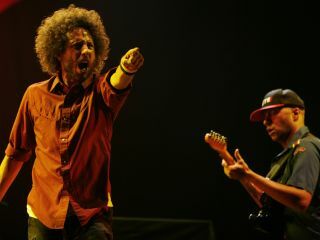 Rage Against The Machine will play their first concert in their hometown of Los Angeles in 10 years this Friday (23 July) at the Hollywood Palladium as part of their push for artists and musicians to boycott Arizona because of its new and restrictive immigration law. Conor Oberst And The Mystic Valley Band will join Rage as a special guest. Today, RATM frontman Zach de la Rocha will announce that proceeds from the concert will go to organizations fighting against Arizona's law. Last May, de la Rocha enlisted dozens of musicians, among them Joe Satriani, Cypress Hill, Kanye West, Oberst,Serj Tankian, Michael Moore, Rise Against, Ozomatli, Massive Attack, One Day As A Lion, Street Sweeper Social Club, Sonic Youth and Tenacious D to join The Sound Strike, an open call to boycott the state of Arizona over its recently passed immigration law. Since then, other artists such as Norteno superstars Los Tigres del Norte, Colombian rock singer Juanes and Puerto Rican reggaeton duo Calle 13 have signed on.